Over the next month, my journey consisted of doctors’ visits, pumping 8x a day, a baby screaming at the breast due to bottle preference and low supply, tube feeding, domperidone, and yet my milk never fully came in. 5 weeks in, a friend asked me to go to a breastfeeding support group. I went and hoped no one would notice me feeding formula to my sweet baby who wouldn't latch more than 5 minutes. Everyone noticed, yet no one judged me. 3 months in, at the Breastfeeding Support group that I now attended weekly, a Mama who I hardly knew asked if I wanted her to pump for me, and then another offered to help, as well. This would begin my donor milk journey, and a mental shift in my head that allowed me to stop seeing what I wasn't capable of, and start enjoying the beauty that came from a community that would end up feeding both of my babes! 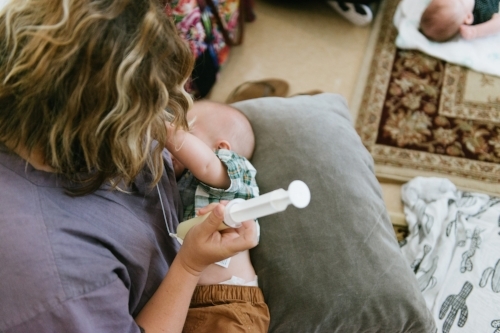 I threw away my pumping and tube feeding schedule right along with the lies that told me I wasn't enough because I couldn't get my body to do what I needed to do to fully feed my baby. We kept nursing as much as possible until 10 months and she got half formula and half donor milk. A few months later, I was pregnant with my son. After my prenatal appointment at the San Diego Breastfeeding Center, I got permission from my doctor to start hand expressing at 37 weeks to collect colostrum to give my baby in the hospital through syringe feeding at the breast to help flush any jaundice he would have since he would be Coombs positive, as well. I started to collect donor milk and I had a community that donated enough breastmilk to supply him 9 full months as I only provided him about 30% of his needs with my own supply. He was born and I had a tiny bit more milk and a lot more confidence. I knew that no matter what, a nourished baby is a loved baby. I knew now that if I needed to give formula, I wasn't less of a mother. If I fed my baby pumped milk, donated milk, only could nurse a few times a day, used a cover, didn't use a cover, nursed for 3 months or nursed for 3 years, no matter what, I WAS ENOUGH. Even after a 6 day stay in the hospital for his Coombs, a tongue and lip tie revision, and a micro supply, we nursed for 10 months with donor milk through the SNS tube feeding at the breast. We then fed formula in a bottle and nursed as often as he wanted. He nursed until 16 months. Today I am working towards my IBCLC, because of the non-judgmental support I received from the San Diego Breastfeeding Center community. They didn't sprinkle magic fairy breastfeeding dust on me that fixed all issues, but they gave me a plan that was doable. They gave me tools to accomplish the goals I set for myself. They gave me hope and they provided me with a community that was there to cheer me on. When I think about my breastfeeding journey, it is less about feeding my children, and more about the discovery that we Mamas cannot mother alone; we were never intended to do so. It takes a village to raise a baby, and for me, it took a village to feed mine. I am forever grateful. Older PostAwesome Opportunity Drawing at the San Diego Big Latch On Event!